It’s been a while since I’ve used my Carradice Super C saddlebag – the lighter, sleeker Porcelain Rocket Booster Rocket seat pack has largely usurped its place. Still, the Carradice’s capacious volume and boxy shape makes for particularly easy packing. Handily, it also fits my Macbook Air. The Bagman Expedition looks to be a more sturdy and off-road capable mounting system to the SQR pictured above, but requires rack eyelets, p-clips, or the likes of a Salsa Rack-Lock seat collar. Similarly, if the dimensions work, you could rest it on a rear rack. 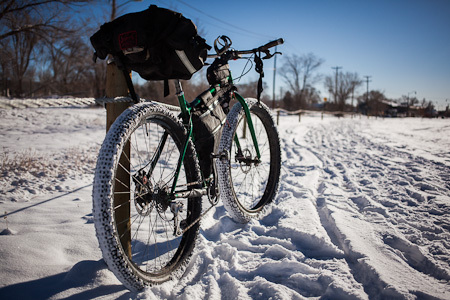 Speaking of winter, for some inspired fat bike snow riding, have a look over here. This entry was posted in Bike Talk, New Mexico and tagged Krampus, snow on December 10, 2012 by Cass Gilbert. The 3 inch tires seem a good middle ground between garden variety tires and the crazy big fatties. I wonder how they’d do in deeper snow. I had a chance to try out a Pugsley after our first big snowfall this year and I have to say it was a lot of fun. I’m sure the relative lack of flotation will make the Krampus more limiting in Alaskan-style snow conditions, but for the odd bit of snowfall here and there, I think it could be pretty effective – and fun. As you say, it seems to strike a good middle ground. I hope you get the opportunity to try out the Freeload rack system. I haven’t had a chance to try it yet, though now that Thule owns the system, maybe it will be become more accessible. It could work well on the Krampus as 1/there’s no eyelets on the seatstays (though the Salsa Rack-Lock looks to fix this) and 2/ it may well be hard to find a rack that’s tall enough. I’m running Knards on the older style Stan’s Flow rims – so pretty narrow. I’d like to build up a new wheelset for the Krampus with a Rohloff I have and some wider rims. Thinking about either Rabbit Holes or Velocity P35s. How are you liking the RHs after using the Knards on your Ogre’s wheels? Any thoughts about going to the P35s instead of the RHs? Vik, I noticed a massive change from running Knards with Rhyno Lites (27mm or so) to Rabbit Holes. The tyre profile was way better, with no ‘wasted’ tread on the sidewalls – the Knards and RHs just seem to be designed to go together. And, I could run lower pressures without any tyre wobble. Lastly, Rabbit Holes, Knards and Ghetto Tubeless make a great combination – easy to install, and no issues at all since I set them up. In fact, my original plan was to built the Rohloff with a P35 – but then I decided it sounded a bit light for what I had in mind, and I heard stories of easy denting. These are wheels I want to be taking to South America, worry-free. As I couldnt make my mind up, I ended up re-using the Rabbit Holes, as an experiment to see how they fared, and to see if anything else that was a little narrower appeared in the meantime. The other contender was Sun’s MTX 33s. They’re not as light, but they’re cheap, and if they’re anything like the Rhyno Lites, they should be super stout. So far, I’m really pleased. The RHs are staying true, on both rocky, challenging mountain biking trails and bikepacking trips. Gypsey by Trade Nick did a great job putting them together. The only downside for me is that their 50mm width isn’t ideal for some of the light, faster rolling tyres I like, such as Marathon Duremes. BTW – been using P35s on my FS 6″ MTB in really rocky terrain in UT, AZ and BC for a year. Those rims have been bomber and perfect tubeless. When I get my next FS MTB I’ll be fitting P35s again in 650B. I’m sure the P35s would do the job, I hear really good things about them most of the time, and trust most stuff by Kirk Pacenti. It’s just that I’m just after something a little heavier, as I don’t travel too light. The Rhynos are so good (and cheap!) I figured I might try out their disc brake cousins, the MX series. I did read recently that Velocity are due to bring in a 45mm rim – a P45 though perhaps not necessarily that name – but can’t find the link at the moment. I have heard about the P45 aka Blunt 45 Velocity rims. I’m not sure when they will be available. I also figured they would be heavy enough that I would be better off with RHs. Given the abuse Surly’s single walled fat bike rims are taking I’d be pretty comfortable with the durability of RHs for my use with a modest touring load. Part of the appeal of sticking to P35s was the weight savings. Once that’s gone as you note the RHs and Knards were meant to work together well.